The Final Fantasy XV journey has been concluded with the release of Episode Ardyn. For the first time, players take control of Noctis's greatest foe Ardyn Lucis Caelum with a brand new storyline taking place 35 years before the events of Final Fantasy XV and learn what drove the scorned savior to seek revenge against the line of Lucis. Final Fantasy XV: Episode Ardyn is now available for $ 9.99 / € 9.99 for PlayStation 4, Xbox One and PC. You can dive deeper into Ardyn’s mysterious, forbidden past in Final Fantasy XV: Episode Ardyn - Prologue, a short anime movie that offers a deeper understanding of the game’s world view and story. 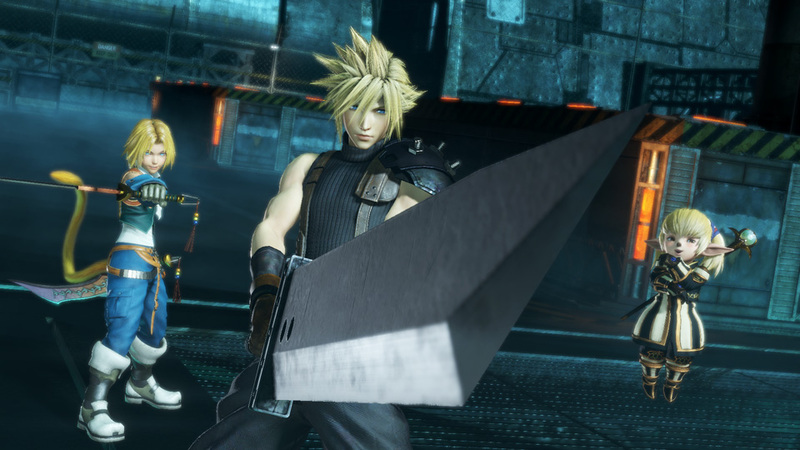 Recently Square Enix announced that Dissidia Final Fantasy NT will be getting a free version called Dissidia Final Fantasy NT Free Edition and that this version together with the full version will be released on Steam. Now they're available on PlayStation 4 and Steam. 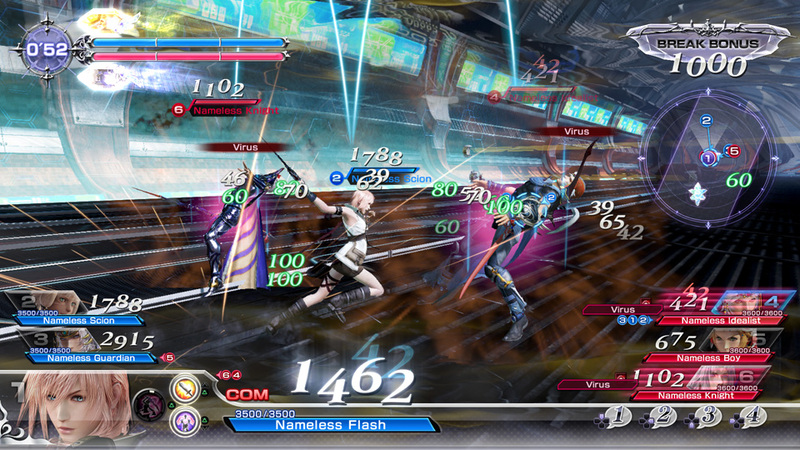 Dissidia Final Fantasy NT Free Edition is a limited version which contains no story mode. You can battle online (against other players of the free and full version) and offline with 4 characters, who change weekly. If you want to keep a character unlocked, you can buy a character starter pack. Please note that if you want to play online on the PlayStation 4, you need an active PlayStation Plus membership. If you want to play the story and gain access to 28 characters, you need to buy the Standard Edition. The Deluxe Edition contains 6 additional characters, costumes and weapons. Square Enix has announced in a press release that Kingdom Hearts III has shipped more than 5 million units globally, both physical and digital, across all platform since it's release on 29 January. This makes Kingdom Hearts III the fatest selling game in the history of the Kingdom Hearts series. 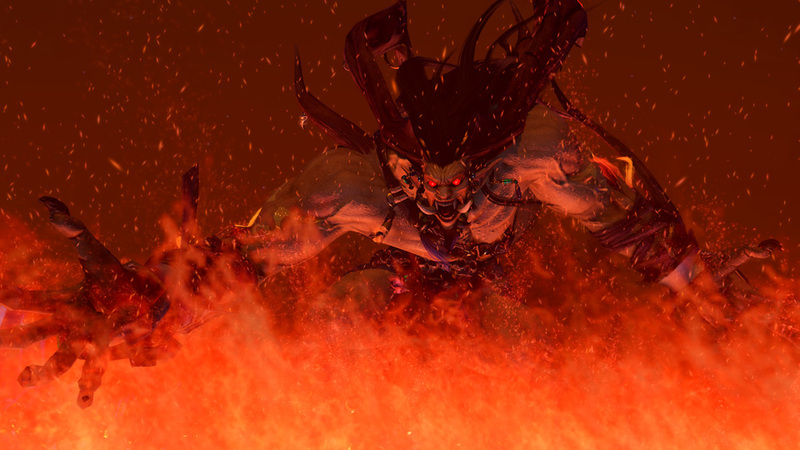 LOS ANGELES (Feb. 4, 2019) – SQUARE ENIX® proudly announces that KINGDOM HEARTS III, the latest mainline entry in the beloved action RPG series, has shipped more than five million units globally, both physically and digitally, across all platforms since its January 29 release, making it the fastest selling game in the history of the series. Dissidia Final Fantasy NT for PlayStation 4 announced! Square Enix has announced that Dissidia Final Fantasy NT will make its debute in North America and Europe on PlayStation 4 early 2018. The console version of the arcade version is developed in partnership with Team Ninja from Koei Tecmo Games. Offering strategic online and offline play, players can select from over 20 legendary characters and familiar summons, including Ifrit, Shiva and Odin, to bring into 3 vs. 3 battle. 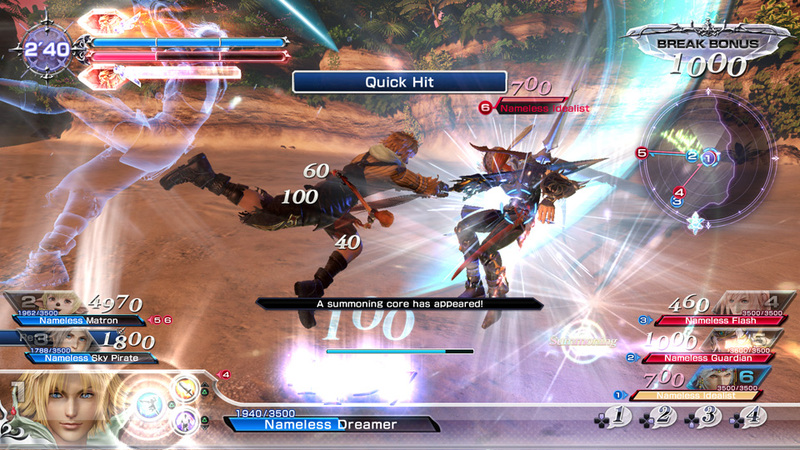 The game also brings back the Dissidia series’ unique “bravery combat system,” alongside unparalleled visuals and seamless gameplay. During E3 2017, on 13 June at 10:15 GMT producer Ichiro Hazamaand and director Takeo Kujiraoka, will be present during the E3 Coliseum providing more information about the game. Today Square Enix has released a new update for Final Fantasy XV; the March 2017 update. Together with the update a teaser video was reavealed showing footage from the March 2017 update and Episode Gladiolus, which will be available tomorrow. Chapter 13, Verse 2 can be started from the main screen and you'll take control over Gladiolus (together with Ignis) searching for Noctis. The alternative chapter features gameplay elements from Episode Gladiolus, which will be available tomorrow for € 4.99 / $ 4.99. A season pass can also be bought for € 24.99 / $ 24.99. 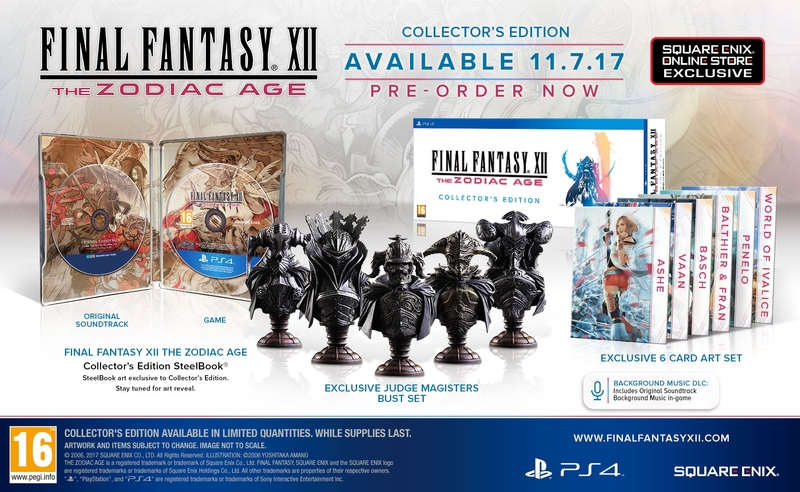 Square Enix has announced that Final Fantasy XII: The Zodiac Age will get a Collector's Edition that is only available at their store. The collector's edition will go on sale on 11 July 2017 for $ 199.99 / € 199.99 and can be pre-ordered at their store. NieR: Automata now available on PlayStation 4! Today Square Enix has officially released the PlayStation 4 version of NieR: Automata in Europe. Earlier this week the game was released in North America. NieR: Automata is the sequel to NieR and developed in collaboration with Platinum Games and delivers the perfect mix of action and RPG gameplay. Players will battle as androids 2B, 9S and A2 as they fight to reclaim the world for their human creators and uncover truths long forgotten. The PC version will be available next week on 17 March. During the Final Fantasy 30th Anniversary event that took place earlier today in Japan producer Hiroaki Katô has annoiunced that Final Fantasy XII: The Zodiac Age will be available for PlayStation 4 on 11 July in North America and Europe. Japan will get the game on 13 July. Final Fantasy XII: The Zodiac Age features the world of Ivalice like never before with enhanced high-definition graphics and for the first time ever, western audiences will be able to experience the Zodiac Job System, a 12-job character progression system first introduced in the Japan-only release, Final Fantasy XII: International Zodiac System. The title will also feature a remastered soundtrack, 7.1-surround sound, an auto-save feature, faster loading times, a new Trial Mode and more. With this announcement comes a brand-new piece of key art from famed character designer and artist Akihiko Yoshida.